The Center for American Progress has invited Israeli Prime Minister Benjamin Netanyahu to speak on Tuesday, November 10, following heavy pressure from the Israeli Embassy and AIPAC. Sign our petition below to CAP's president telling her that Netanyahu is #NotProgressive and has no business speaking at a self-defined progressive policy institute. 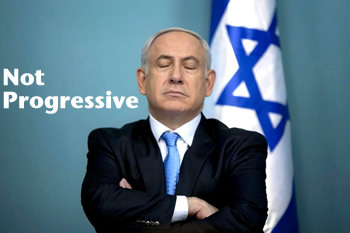 Please disinvite Israeli Prime Minister Benjamin Netanyahu from speaking at the Center for American Progress. As a self-defined progressive policy institute, CAP would be dishonoring its mission by allowing its venue to be used by Netanyahu to promote his hateful, discriminatory and racist policies toward Palestinians. Netanyahu's attack last year on Gaza killed more than 500 Palestinian children. He has stated that Israel will retain control of Palestinian territory for the foreseeable future without giving Palestinians any rights. He opposes Palestinian statehood and blames Palestinians for the Holocaust. Netanyahu—and Israel's apartheid rule over Palestinians—is not progressive. 16830 3.4 years ago Janet jacobson Los Angeles, CA , US This man is evil. He holds a fascist and savage ideology over all life. He belongs in a gulag and not in front of people to talk about leadership. 16827 3.4 years ago Jean-Jacques Amy Ixelles, ot , BE Israel should abide by UN resolutions. Its occupation of Palestina is a blatant transgression of international law. 16826 3.4 years ago Jean Standish New York, NY , US Netanyahu is not interested in a two-state solution. In fact, his policies have worsened the Israel-Palestine situation. 16817 3.4 years ago Philip Ratcliff Salem, OR , US This is a late email, after the fact. But don't invite Netanyahu again. He's a war-mongering right-wing reactionary.